The sigh-inducing wallpaper is free, at the MBA site. You could wake up to this every morning, each time you turn on your computer. Sigh. MONTEREY BAY AQUARIUM, which just happens to be home to sardines and cephalapods and, yes, you betcha, those world-famous otters, too. And while the monthly free wallpaper provided by the Cannery Row aquarium — it's downloadable, in various sizes, from the web site — frequently depicts some sort of critter that calls the landmark home the August scene is a serene one, and totally about the new day, the spectacular sky, and the historical building itself (yes, it's the site of the former Hovden Cannery, which is well-depicted inside via an excellent display). 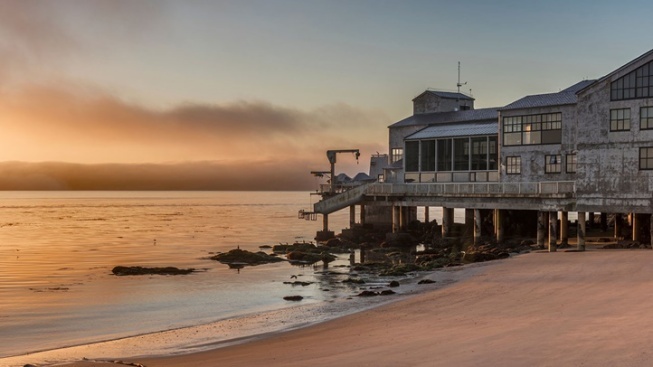 If you need to soak up some morning beachiness, and Monterey marvelousness, each time you turn on your computer for the next few weeks, well, understood. Otters don't make waffles, and sardines don't shower, but we can all appreciate an ocean morning with a beloved aquarium in the foreground.